The holiday season is a time associated with joy, festive tradition, and the company of family and friends. Unfortunately, those who are suffering with an eating disorder (ED) typically have a much different experience. Their enjoyment is often overshadowed by increased anxiety, urges to lean on unhealthy coping skills, and an overwhelming sense of dread. Instead of being in the moment with loved ones, they may be flooded with guilt, shame, and negative self-talk. Intrusive thoughts about weight, calories, and the way others might perceive them distract from beloved holiday traditions. Create a list (with your therapist or on your own) of triggers you are likely to experience, and pair each with a coping skill (or many). Bring helpful distractions to gatherings. Use the “buddy system” by sharing concerns with a trusted support ahead of time, share how they can be helpful, and let them help. When anxiety is climbing, repeat to yourself your affirmations (“I am safe and I can do this.” “Any foods can fit into my meal plan.” “Food is medicine.”). Creating an itinerary for busy days can help to make the days feel manageable. Give yourself permission to prioritize your recovery. You are not obligated to sacrifice your own well-being to accommodate others. 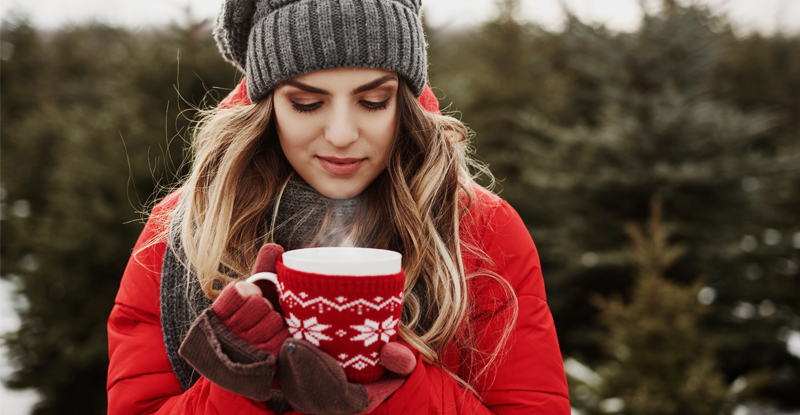 If your holiday schedule tends to be packed full of parties and family gatherings, you can choose to attend some and respectfully decline others to make time for self-care. If you are triggered by diet and exercise conversation, change the subject or excuse yourself from the conversation. Well-intentioned family members may ask directly about your recovery. It helps to decide beforehand what you are and are not comfortable discussing, and be ready to set this boundary in an effective way. Self-care is essential in maintaining physical, mental, and emotional wellness, particularly when stress is high. Getting enough sleep, eating 100 percent of meals, and spending time on enjoyable activities help decrease vulnerability to negative emotions. You do not have to do anything to “earn” nutrition, rest, relaxation, enjoyment, or peace of mind. You are human and you inherently deserve these things. It is normal to feel scared, vulnerable, and exhausted. Let go of perfectionistic expectations. Set realistic, achievable goals and be kind to yourself if you struggle because struggling in a difficult, stressful situation is normal. If you slip into old patterns or act on an urge, forgive yourself and decide to try again. Stay mindful of your thoughts and allow the distorted, judgmental, critical thoughts to pass. Ask and Let ED sufferers tell you how to help. Do not assume what they feel, think, or need. Be mindful of discretion, and avoid judgment. Remember that they are forced to face their biggest fear at every meal, and put yourself in their shoes. Imagine you are phobic of heights, and part of meeting your basic needs for survival involves jumping from an airplane multiple times each day! Consider how you would like to be supported. Show warmth and compassion, practice patience, and remember that your loved one did not ask for this illness. Show them they are worth recovery by offering support when it is easy—and especially when it is not. Remember that nobody is perfect. Expecting perfection sets us up for disappointment. There will always be positives and negatives present with us, and we are in control of where we choose to invest our time, energy, and attention. Consider what makes the holidays special for you. What seasonal traditions do you look forward to? Whom are you excited to spend time with? Allow yourself to appreciate the little joys that come with the season. Notice the times when you feel at ease, even for a moment, and enjoy them. Gratitude is powerful armor against the ED. You will get through each challenge you face, and you will be stronger in your recovery for it.